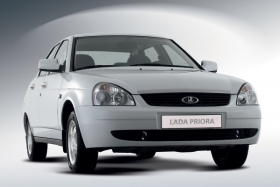 The Lada Priora is AvtoVAZ's top-selling model in Russia. MOSCOW (Reuters) -- May new-car sales at AvtoVAZ, Russia's largest carmaker, increased 60 percent year-on-year, company President Igor Komarov said. Sales rose to 46,000 units in the Russian market alone, according to Komarov. Domestic demand has been boosted by a scrapping incentive scheme, with overall Russian April sales up 20 percent year on year after 18 months of declines. April was the first full month that the Russian government has offered car buyers 50,000 rubles ($1,700) to trade-in cars that are at least 10 years old for new models that are built in Russia. The program has enough cash to subsidize the sale of 200,000 vehicles. AvtoVAZ sold 28,163 vehicles in Russia in May 2009, and 61,583 in May 2008. Vladimir Putin, Russia's prime minister, has been eager to support domestic carmakers as Russia emerges from its first recession since the 1990s. He met with steel producers on Monday to negotiate a compromise following a series of complaints by industrial producers over rising prices. Under the agreement, steelmakers will raise prices by 22 percent from June until end-2010, well below previously planned increases of up to 30 percent. Nonetheless, Komarov told journalists Monday that higher steel prices would cost his firm at least 1.5 billion rubles ($48.5 million) this year.